2002 marked the 40th anniversary of University Challenge, the longest running quiz show on British television. To celebrate the producers invited back as many series-winning teams, and in a few cases losing finalists, as could be tracked down. Each show began with the team reminiscing about their days on the show and the obligatory embarrassing shot of how they looked back then. The series ran from 25th March 2002 to the final on 19th August, and instead of being a knockout, only the four highest-scoring teams progressed to the semi-finals. In the table below, for the first round, the team name links to a photo of them on the show and the year links to the page for the series that they featured in. Links to external articles are in the table at the bottom of the page. A truly stunning performance throughout by Sidney Sussex, consisting of John Gilmore (History), John Adams (Medicine), David Lidington (History) and Nicholas Graham (English) demonstrated that they fully deserve to be called the greatest champions team in the show's 40 year history. 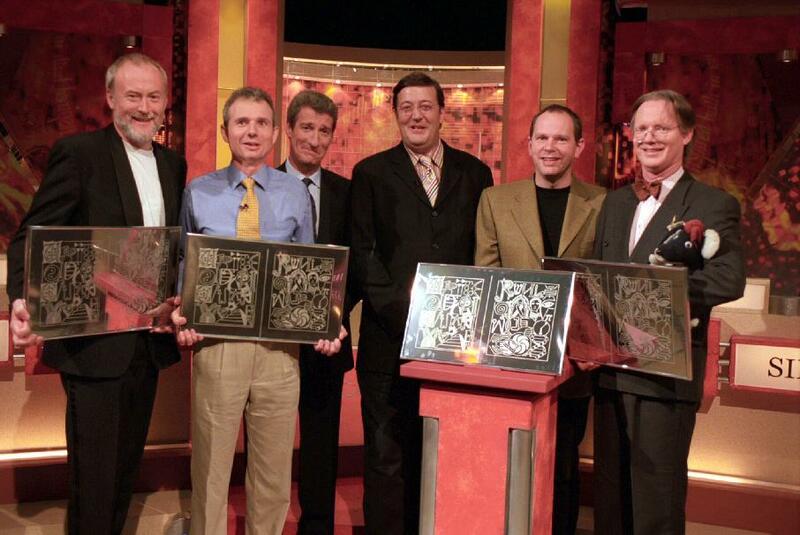 They were each given a replica trophy (a flat, framed version of the metallic book, just like the one that current winning teams are awarded when the original is handed on the following year) by Stephen Fry, himself a member of the Queens', Cambridge team that reached the finals in 1980, losing to Merton on a tie-break in the second match of the then set of three that would have given them the championship, and then losing the third. Note that the system Granada use for denoting the year each team was champion differs to mine; for example, Trinity were champions of the series which ran from September 1994 until March 1995. I have named them the 1995 champions, whereas Granada named them "Trinity, 1994". However, even they contradict their own scheme by naming Somerville 2002 champions! However, the series has unearthed a greater mystery, which together with information from other past winners, too numerous to mention, I believe I've just about unravelled. It began during the filming of the Reunited series when several of the contestants from the Bamber Gascoigne days commented that the year written on their desk was a year out. However, Granada had no replacement nameplate so it had to stay. So many commented that in later filmings they printed several so the teams could choose the correct year! A member of the winning team of series 18 even wrote to the Guardian to correct an article. Thus, many of the early shows give the winning years of the teams as a year later than it actually was. Although the shows were generally filmed between Autumn and Spring, they were usually broadcast in a single year. For example, series 5, of which Keele "1969" were the champions, was filmed during the academic year 1967-8, with the final filmed and shown in July 1968. I shall thus call Keele (as the team themselves do) the 1968 champions. This continues until series 21 which was filmed and shown entirely in 1984 with Open University winning in December. There was then a gap, with Jesus College, Oxford winning series 22 in 1986. See the winners page for the correct years, and the results page for full series start and end dates. At the end of August, BBC2 screened a special documentary show, compiled by Granada, chronicling the 40 year history. The teams that returned consisted of the original four team members with some exceptions. Bradford, 1980, were unable to track down John Watt in time for the show so he was replaced by original reserve Martin Lee. Jesus, 1986, replaced Jonathan Smith, who died in 1986, with original reserve Rufus Boyd. University, 1983, replaced Nick Long with original reserve Bob Bunting. Dundee, 1983, replaced captain Donald Kennedy with Craig Murray. St Andrews, 1982, fielded original reserve Malcolm Hiseman in place of Stephen Watt. Fitzwilliam, 1973, replaced Philip Bassett with reserve Simon Tuite. And Churchill, 1970, used Andrew Brown instead of John Armytage. Oriel, 1966, used the team they had on the 1965 series, with Eric Foner in place of Neil Murray who had taken his place in 1966 when Foner had returned to the US. Teams in bold qualified for the semi-finals as the highest scoring four. Teams in italics were never series champions; Lancaster, University College, Oxford and Trinity College, Oxford were the series runners up, and St Hilda's, Oxford, lost in their semi-finals.